For you to truly understand why addiction is considered so complex by the addiction treatment, it's important to look at a few of the psychological principles of addiction that addiction professionals at these facilities look at in order to assess your current situation and to prescribe treatment for substance use. It's important to note, that this is a perspective from the treatment industry, whose methods have been found ineffective and often harmful by the Freedom Model Retreat's research team. Throughout this piece, we will explain how these psychological principles of addiction can be inaccurate and cause more harm than benefit. "Addicts" Can't Change On their Own: Many addiction specialists believe in the fact that substance users do not find ways to get help on their own because they only trust substance or the act of using, rather than people who may be trying to help them. Many specialists argue that "addicts" mistrust in others is one of the reasons they use in the first place. However, contrary to public opinion, there is no program that can make someone choose to stop drinking and/or drug using. This is one of the greatest flaws in the psychological principles of addiction. There is no magic pill, no meeting, no sponsor, no support groups, no counselor, no rehab, no therapist or doctor, the only person who can effect this change or make the choice to not drink/drug is the substance user themselves. Various independent researches shows the vast majority of people mature out of these behavior problems at some point in their lives and have a much greater chance of doing so once they learn they can. Social Context Plays a Significant Factor in Sobriety: Addiction therapists and specialists promote the fact that the social context or groups of people that the substance user associates such as peer groups, friends, religious communications, work networks, and even treatment environments with can bear a significant risk factor for initiation, escalation and relapse (Gifford and Humphreys). These same specialists promoted and believe that support programs such as 12 step communities and on-going recovery models show less self initiation of drug and alcohol use after treatment. Our culture has systematically come to believe that substance users require extensive aftercare to remain sober and drug free. This faulty belief is a direct result of the popularity of the 12 step-program, Alcoholics Anonymous. If you ask someone on the stress what is the most effective way for people to stop drinking most will say go to meetings. Yet, the data shows the most effective way for people to kick a drinking or drug use habit is to make a commitment to change and do it on their own. In addition, in many 12 step recovery groups relapse is an expected part of lifelong recovery and while they see it as a symptom of a disease there are often harsh judgments cast upon those who relapse and then return to meetings or support groups, making these people more toxic than encouraging and supportive. External environments can provide difficult choices for someone overcoming substance use, but it does not stop their decision to use or not use substance. That power is always controlled by the substance user. Cravings and drug-seeking behaviors: The drug and alcohol industry as well as much of the mental health system are included in the recovery society promotes the idea that your brain tissues is actually in control of you. The recovery society states that we are hardwired within the brain to be addicted, to experience "craving," and to feel depressed among other feelings and that thoughts or choices having nothing to do with any of it. They claim it's in our genes and these are "clinical" conditions that require professional help. Essentially everyone who promoted the brain disease model of addiction believes that what people think is of little or no consequences to what they do. Believing that the brain theory of addiction holds, the "one track mission to seek and use drugs" is caused by the structural of the brainâ€”not by what we think. This view is rooted in the belief that brain tissue activity happens first and then thoughts materialize and bubble out of that blood filled tissue afterwards. These views need to be understood so that a substance user can make a decision on whether they believe that they have the choice to control their own behaviors. A choice to believe in one or the other is unavoidable. In reality a person already believes in one or the other view based on how they view their own personal responsibility and whether they believe they are "out of control" in regards to their substance use. If a person believes in this evidence of own free will they are at total odds with the beliefs of the recovery society. There are clearly numerous flaws in the psychological principles of addiction and its treatment used by many addiction specialists today. 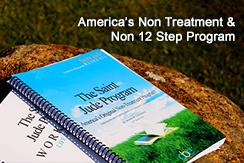 If you truly believe that you can change your life and have the desire to understand what addiction is and what it is not, the Freedom Model Retreats program will work for you. Source: Gifford & Humphreys, Elizabeth & Keith. "The psychological science of addiction" Addiction & Its Sciences (16 October 2006): 353.